Tree of Life design, Baluch tribes, Iran/Afghanistan. The Oriental Rug Society of NSW Inc (ORS) was founded by oriental rug enthusiasts and collectors in 1980 and has continued to attract interest ever since. We welcome as members everyone interested in the carpets, rugs and other textiles from the tents, villages and urban workshops of Eurasia. This multicultural region once traversed by the fabled Silk Road comprises Turkey and Iran, the Caucasus, Central Asia including Turkmenistan, Uzbekistan and Afghanistan, and much of Western China. 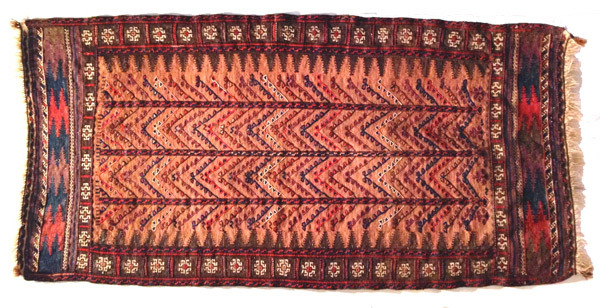 To foster an interest in and appreciation of oriental rugs & related textiles through exhibitions, talks and seminars. To provide a forum for collectors, researchers and enthusiasts to examine and discuss these textiles in all their aspects. To assist the Powerhouse Museum, of whom we are an affiliated society, to expand its collection of these textiles. Our meetings at the Powerhouse every two months feature talks on oriental rugs and related topics and include refreshments. Members receive a regular informative newsletter by e-mail. This covers forthcoming meetings, local textile events, and various aspects of oriental rugs – design, colour, history, classification and so on. To join the Oriental Rug Society of NSW, go to Join Us on this site. For general information, contact info@antiquerugs.com.au.